Usually an increase in bounce rate is a bad thing however, we know there can be a lot more to the story than meets the eye. The key word (no pun intended) in Google’s definition is “homepage”. If people entering your site through the homepage are leaving without visiting a second page, that can be symptomatic of a serious issue however, what if you are sending users to a page deeper within the site? What if the user is so deep that there is no “second page” to navigate to? This can change everything. Can a higher bounce rate actually be a sign of quality? In our experience, yes. When comparing year over year search data for one of our customers, we came across a perfect example of why bounce rate should not be evaluated without proper context. This year we made huge improvements to our Online Retailer’s SEM account that included providing deeper, more specific landing pages for their variety of keywords. Landing page content is directly correlated to bounce rate however, there is no certainty regarding whether or not the bounce rate will increase or decrease because of a landing page change, even if there is an improvement made. It depends entirely on the individual situation. Consider this: If your landing page is a “Choose your language” page, you will likely have a very low bounce rate as most people are patient enough to make it past that initial step. If however, the page is modified to provide deeper content, it will almost certainly result in a higher bounce rate because the “next step” requires more thought and commitment from someone than simply selecting a language preference. By way of example, we are working with an Online Retailer whose SEM campaigns, specifically those supporting furniture, were not built optimally. One of the main issues we addressed early on was landing page selection. They originally had all of their furniture keywords (everything from bedroom headboards and dining tables to sofas, lamps and bookcases) leading to the same General Furniture landing page offering a view of all furniture categories accessible on the site. Despite the granular keyword set, the landing page didn’t narrow anything down for visitors based on what they were searching for. Users had to drill more deeply into the sections to find what they were searching for. Interestingly, the aforementioned page recorded a very strong (low) bounce rate of 16.67%. Who could complain about that? But let’s look at the factors that resulted in this impressive bounce rate. Considering the broad nature of the landing page, users were faced with a pretty easy task upon entry; select one of the sub-categories with the end goal of finding what they were searching for. It’s important to remember that getting even one click past the initial entry page prevents the “bounce” from recording. So someone clicking from the “General Furniture” page into the “Bedroom Furniture” section, for example, would be enough. In the example below, the searcher can either A) Click into a sub section so that they can see something more aligned with what they were searching for or B) Leave the site altogether without pursuing their search. You can see why the bounce rate was so low. Most people would at least be curious enough to click into the category of furniture they were seeking. After being awarded the customers’ SEM mandate, we moved to improve the user experience, upgrading the landing page structure by refining the keyword groups and sending users searching for specific products to the corresponding sub-sections of the site (instead of to the General page_. With the new and improved strategy in place, users were much more likely to get immediate satisfaction from that one page visit compared to the General Furniture Page which offered a selection of different categories to explore. With these changes in place the user either A) Clicks into a specific product model or B) Has the information they sought and leaves, resulting in a “bounce”. So now that we are following the rules of SEM to a tee, bring on the lower bounce rate right? Not so fast! 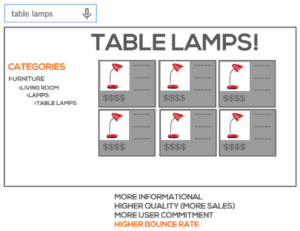 Our customer saw the bounce rate on furniture keywords nearly double to 31.6%! And if your bounce rate is higher, visitors are less engaged with your content, right? Not necessarily. Before we made changes to the landing page the bounce rate could have simply be supressed by the navigational nature of the page which forced the user to work a little harder to find what they were searching for. In comparing the above 2 scenarios, the first version of the landing page was saying “where do you want to go?” while the modified page was saying “which one do you want to buy?” Which do you think is more likely to result in a second page visit? We haven’t yet touched on what really matters. Sales! The data shows that while the bounce rate was negatively impacted, users who did not leave the site were much more likely to make a purchase, probably because the new landing page structure made it so much easier for them to do so. Conversion rate improved by 120% on all furniture keywords after we made the changes. 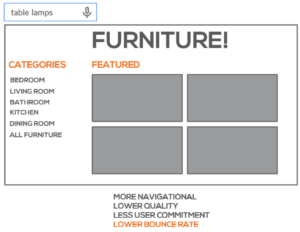 We also discovered that in the furniture category the more specific the landing page gets, the higher the bounce rate. Will this always be the case? Absolutely not but this illustrates that bounce rate should never be evaluated on its own. Each case is different and several other companion metrics are needed to get the whole story. While a high bounce rate, more often than not, is a sign of a poorly optimized campaign and/or web site experience, bounce rate is not as black and white as it appears. It is critical to look deeper into the data to find the truth behind the numbers. Remember, stick to your KPIs. Optimizing towards bounce rate alone is not a good idea. If your performance is where it needs to be, bounce rate probably isn’t an issue (even if it’s scary high_. There are always ways to improve your bounce rate but they won’t guarantee improvement in conversions. It could actually end up having the inverse effect.